The hand embroidery craze is one of my absolute favorite craft trends, and there are some uber-talented people in this space right now. Luckily, many are sharing their talents and putting together beautiful, all-in-one kits to purchase. These would also make thoughtful gifts for crafty friends and family. Florals and Floss is an Etsy shop run by Alexandra Strakotter from Canada. In her own words: “I've always loved creating and making things, and after falling in love with embroidery I opened this shop. Based in Edmonton, I design and hand stitch each piece myself, drawing inspiration from nature. My hoops are a little whimsical, a little kitschy, a little trendy, and sometimes a little witty.” Check out Alexandra’s Honey Bee embroidery kit. Tamar’s work is sweet and delicate, a nod to her experience as a children’s illustrator. In her own words: “After six years as a graphic designer I was itching for a change and wanted to follow my dream which was to illustrate children’s books. Embracing my passion for illustration proved to be a gateway to new mediums and projects. I began creating one-of-a-kind drawings for my two daughters, which slowly evolved into a product line. In 2011 I opened a shop on Etsy to sell my postcards and prints. It wasn’t until customers began requesting permission to create embroidered versions of my works that I considered branching into the world of textile arts.” Check out Tamar’s Green Garden Embroidery Kit. The Autumn Wildflower pattern and kit was designed by Forth Worth-based Colleen of the shop “And Other Adventures”. In her own words: “I had lots of adventures - I went to college, built an IT career, traveled all over the world, fell in love, got married, and had my babies. And as with all people who live life to the fullest, I also experienced my fair share of heartache, loss and dark moments. It was during those times that I would make my way back to embroidery, books, and flowers as way to ground me and rediscover a slower, simple calmness. So it is on that note, that I opened this shop. I want to celebrate all of life’s adventures – from the bright and shiny moments to the moments of everyday magic as well as the moments that hurt. There is beauty in all of it. Because, after all, those adventures combined are what represents a life well lived.” Check out Colleen’s Autumn Wildflower embroidery kit. Ellucy Stitches is run by Mallory Bailey in Richmond, Virginia. Her designs are irreverent and fun. The kit includes DMC thread, embroidery needle, embroidery hoop, pattern, and pre-printed fabric. 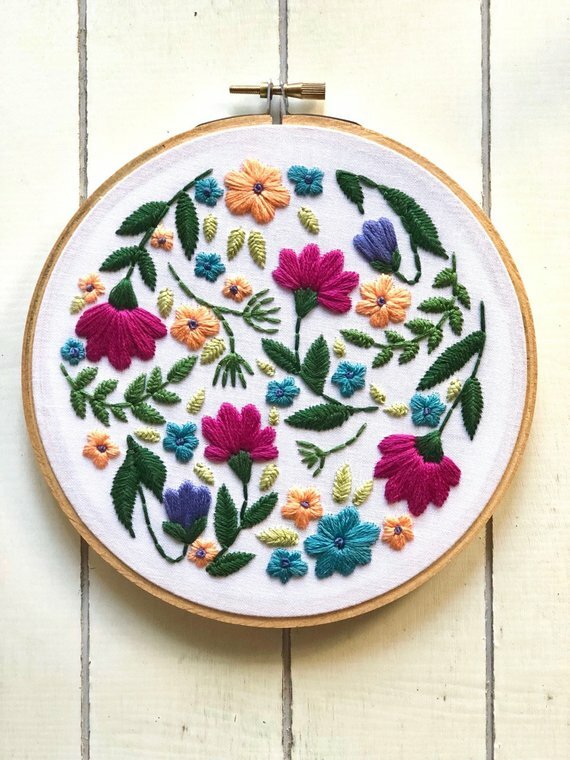 Check out Mallory’s Floral embroidery kit. Designer Liz from Asheville, North Carolina, offers more than 92 patterns and kits in her shop Cozy Blue. In her own words: “Most of my products begin as a gift idea for someone in my own life or something I find useful or meaningful, and I'm happy to find that a lot of other folks feel a connection with them too.” Check out Liz’s “Show Up” embroidery kit. Jenny Blair creates her nature-inspired designs in the United Kingdom. In her own words: “When I was 9 years old I was introduced to embroidery. It was literally love at first stitch though the fact that I won the sewing prize at school that year may have helped! But it's never left...that utter delight and pleasure in the simple act of sewing.... Each stitch, the thread colours, the design I am sewing, the finished item... Oh it makes me happy indeed..... and so the motive behind the kits and patterns you find here.” Check out Jenny’s Winter Greens embroidery kit. Whether you need beginning instruction or a general refresher try the following online classes. In my experience hand embroidery is hard to learn on your own just by looking at photos. Even the best books still left me scratching my head when I was learning. I’ve found that in-depth video lessons were a game-changer. Leave A Comment Below and Let Us Know Which is Your Favorite Kit!